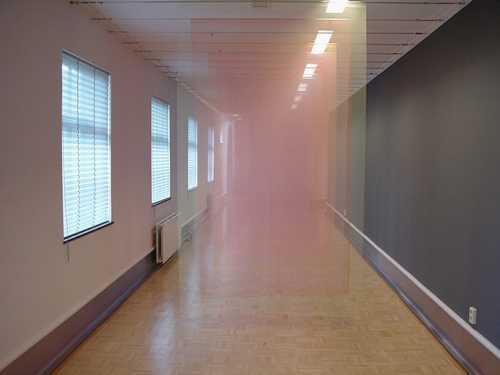 “Pent-up Sighs” was installed by Dutch artist Anke Kuypers in the Museum Smallingerland, Drachten, as part of her exhibit In Kleur (In Color), from 24 February to 11 April, 2001. The hallway was quite short, hardly a hallway at all. We walked between unadorned walls for only a few paces, and then both walls ended. To the right was a broad curtain of pale yellow gauze, so fine I could see straight through it into the small but immaculately kept atrium beyond. Open to the sun and sky, the atrium was like a well carved out of the house, a reservoir spilling over with heat and light. At its center a tiny fountain splashed. The gauzy curtain rippled and billowed gently, like a mist disturbed by a puff of air, like a living membrane sighing at the slightest breeze . . . . The yellow curtain rippled. A gust of warm air slipped beneath its hem and entered the room like a mist clinging low to the ground. I felt it pool and eddy about my feet, heavy with the scent of jasmine. The morning was almost over. The true heat of the day was about to begin. I suddenly felt sleepy . . . . I sighed. The curtain sighed. The heat crept up my feet and legs, like water slowly rising in a well . . . .
Cicero glanced away, peering into the translucent folds of the yellow curtain, as if he could see beyond it all the human refuse of Rome . . . . I looked away. My eyes fell on the yellow curtain. Like Cicero a moment before, I found myself gazing at it and into it, as if in the vagueness of the shapes beyond one could indeed make out the images invoked by memory or suggestion.